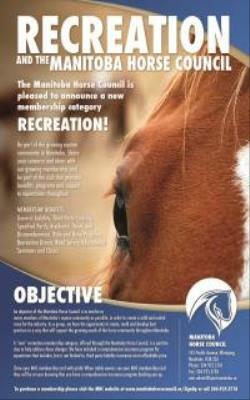 The Manitoba Horse Council (MHC) offers a special membership category for Recreational Riders! This membership was created because we sincerely believe that the future of MHC lies in acquiring a strong recreational membership base. Equestrian competition will always be an important aspect of the work of the Manitoba Horse Council, but the reality is that most of the equestrian enthusiasts in Manitoba, and across the country, are not competitive. They are involved with horses and ponies of all types and breeds for the sheer love of the animal and the love of the outdoors. And theirs is a voice that has not been represented adequately through the provincial body for equestrians in this province. This membership category helps to change that. It offers the opportunity for Recreational Riders and Drivers to join the Manitoba Horse Council at a reduced fee. It provides these new members with excellent insurance benefits, and quality programs and initiatives directed specifically to meet their needs and interests. And this is just the beginning. As our membership in this category increases, the Manitoba Horse Council will be better able to connect more with recreational riders and drivers, and with agencies in the equine industry, to sustain, develop, expand and/or provide supports and services to meet their specific needs. Help us to meet our goal of having all equestrians become part of the growing and vibrant equine community of the Manitoba Horse Council. Be the voice that encourages others to join!! See Membership Benefits for full details and how to become a Recreational Member now!